A 1-year-old boy came home from a D.C. daycare with a huge chunk of hair missing. The boy's parents say a teacher at the daycare said another child pulled the hair, but the video allegedly shows the teacher pulling it. Police said they are investigating the alleged assault. A D.C. day care employee has been charged for allegedly ripping out a large chunk of hair from a toddler's head. 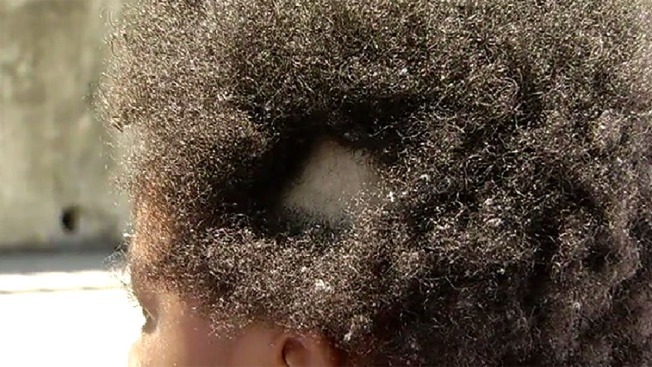 The parents of 1-year-old Demarco said he came home with a huge bald spot on his head on Tuesday. A teacher at the Kids Are Us Learning Center in Southeast D.C. told them another child pulled out his hair. "It was disturbing, like, all I could do was get upset and just cry," said the child's mother, Daizha Rosser. Rosser and the boy's father, Lawrence McEachin, said they demanded to see the day care's surveillance video. They said the video shows the teacher pulling out their son's hair -- not another student. "Pull, pull, pull. He fell; [she] pulled again and snatched it right off," McEachin said. "I can only imagine he was crying." Police responded to the daycare Wednesday after McEachin and Rosser got into an argument with daycare staff. "Her excuse was she was irritated. Your job is to watch kids. Kids will irritate you. He irritates me, but you're not going to see me - I'm not going to do nothing of that nature," McEachin said. D.C. police said they are now investigating the allegations that a teacher assaulted the boy. "I'm pressing charges. That's for one. And she should be locked up because it's crazy. They're kids. Your supposed to watch them and monitor them and care for them like they're your own, not hurt them, and that's basically what they did. They hurt my son," Rosser said. Police later said 50-year-old Lisa Vaughn has been charged with first-degree cruelty to a child. News4 spoke with a woman who said she owns the day care. She said she has "policies and procedures in place" and she thinks the incident is "horrific." Kids Are Us Learning Center has two locations and is licensed to care for up to 60 children.